Just an awful, awful title. I apologize. 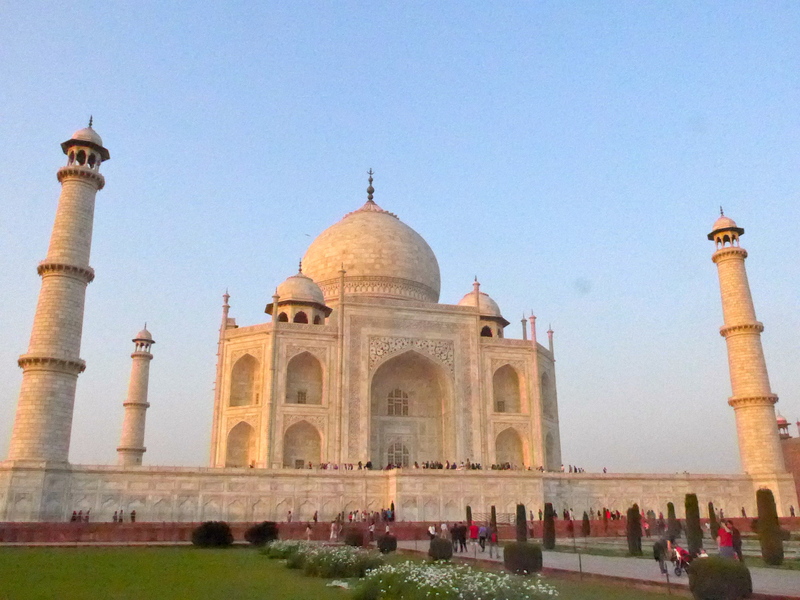 But hey, that Taj Mahal inspires some oohs and ahhs. Agra, in case you don’t know, is where the Taj Mahal is located. The Taj Mahal, in case you don’t know, is a lovely building. I lack the skill-set to describe that building, and being there in person … The closest experience I had to that was seeing the Grand Canyon. Except the Taj Mahal was built. By people. And over the course of only about twenty years! That’s so little for such a magnificent building! I could’ve stayed there, taking picture after picture that would fail to do it justice, for hours and hours. But I’m getting ahead of myself. 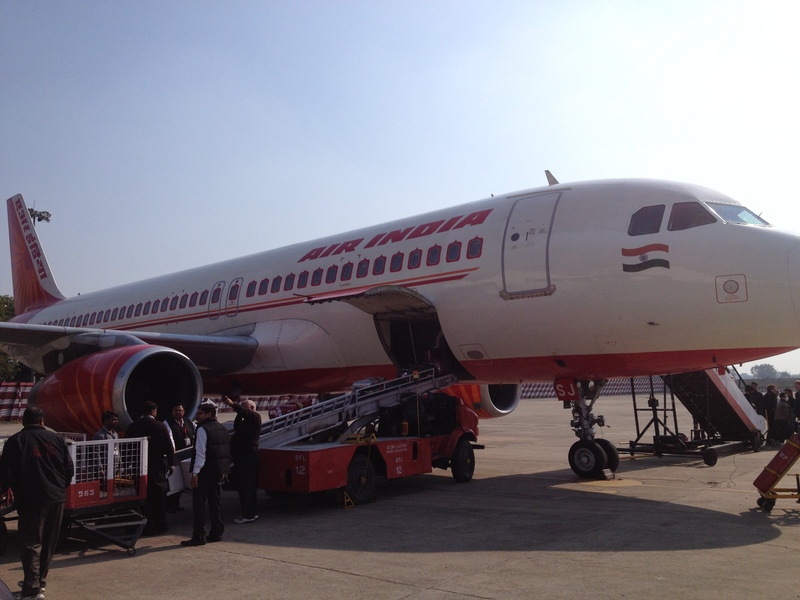 Because the first delight of the trip to Agra was the plane ride. When we went from Delhi to Varanasi we flew Jet Airways, a domestic carrier. The flight included a juice box and a sizable snack despite only being an hour long (the snack was a sort of wrap – vegetarian or non). This time we would be flying Air India, an airline I had looked up before the trip and seen described as “decrepit.” Well Internet, sometimes you’re not just a crazy 47 year old man pretending to be a 15 year old girl, because this time ding ding ding, you got it. The airline experience had two delightful features: the food and the aircraft itself. The food was some sort of white bread (?) with mayonnaise (?) and lettuce (?) … I have no idea if it was actually these items but that’s what it looked like. The Mrs. and I decided to pass on this delightful treat. 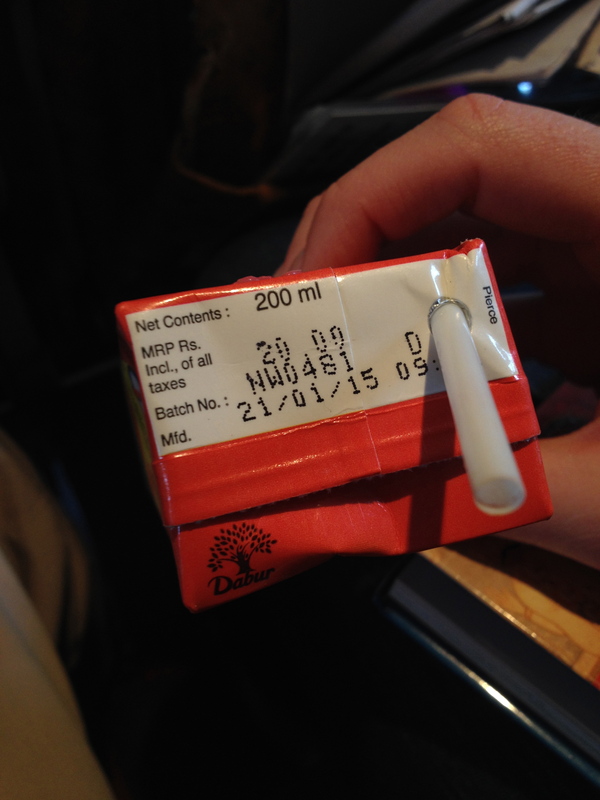 The juice box we helped ourselves to, only to discover it had expired about 2 weeks prior. The taste was fine and we felt fine, but I just couldn’t help but imagine the kind of personal gain someone might try to get out of that if such a thing happened on an American airliner. Perhaps I’m too down on my country though. The second delightful thing was … you guessed it, duct tape! Airplane falling apart? Nothing duct tape can’t handle! Speaking of my country … We also had our first negative experience with other tourists. These tourists were from … Florida! (By way of Jersey.) It was a group of 5 or 6 with one guide who was travelling with them throughout their trip (as opposed to Lauren and I, who had guides meeting us at the places we travelled to). One of the group members was discussing with the guide Indian vs American weddings and expressing displeasure with the local culture (top notch, fella). The American felt like it was silly or even stupid to have women weighed down with jewelry. And when discussing how PDA is taboo in India, “there is no ‘you may now kiss the bride’” said the guide, the American was shocked and condescending. Who knows, maybe Lauren and I drove our guides nuts … and I know for the ones we didn’t care for (like in Varanasi and other cities), the conversation was sparse and they probably didn’t like us (like we’re a disengaged classroom). But in our defense, at least we didn’t openly smirk/frown/do that dismissive ‘hmph’ noise when being told about another culture. Lauren also said she saw me get annoyed in a way she’d never seen. According to her, normally if someone says something I disagree with I might respond with, “yes I see what you’re saying, but have you considered …” or something like that to acknowledge the other person’s thought but to keep pushing my own. With this guy I went straight to counterpoint every time. We had a conversation about technology when he learned I am a software engineer. He asked if it’s possible for people to control electricity in cities by hacking, I said if a city is utilizing a smart grid kind of setup and the protection they have is bad or the workers are careless about passwords then yes … I suppose someone could hack in and mess with a city. He was really pushing the idea of people hacking in to various important things and taking control. I told him that not everyone is bad, and there are a lot of things people can do for themselves like having strong passwords. I guess I didn’t like his rather doomsday outlook on technology and the future. Moving on. 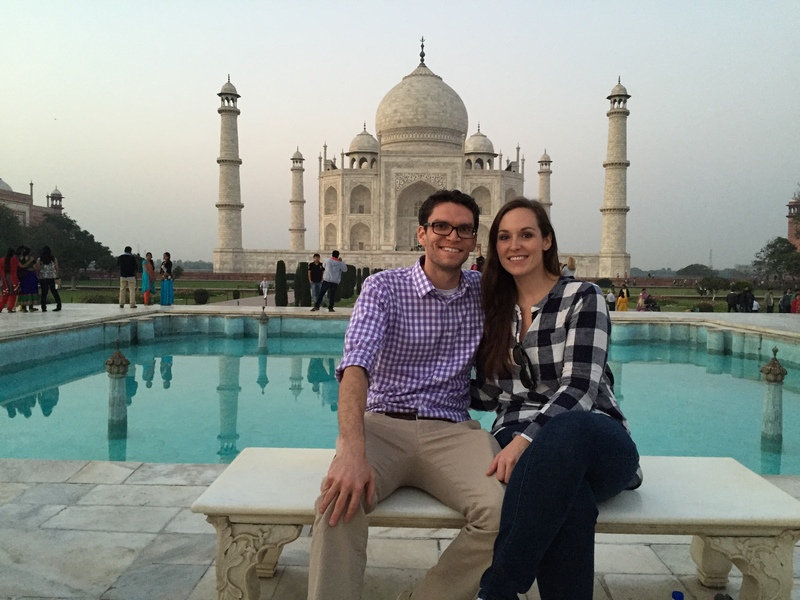 We got to Agra and hopped off the plane. 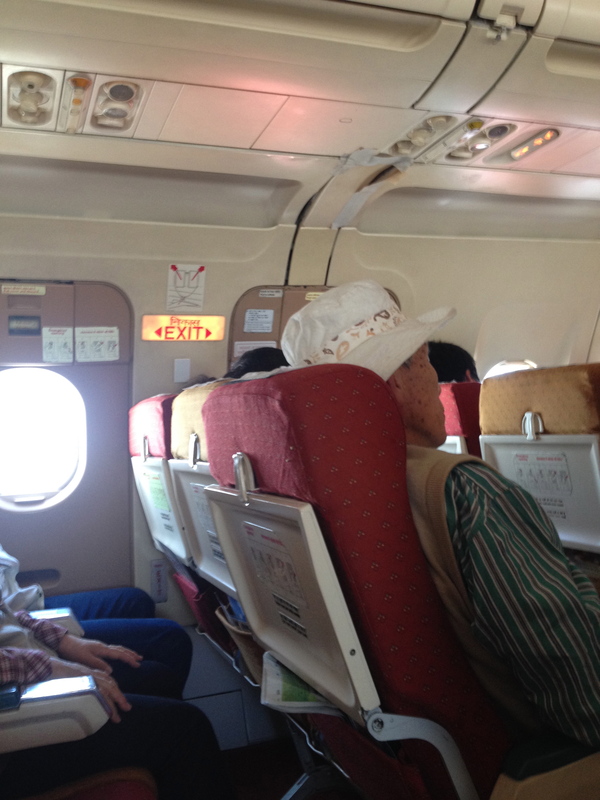 We disembarked on the tarmac (which always makes me feel like a hot shot) and … what? about 400 feet from us was a jet taking off. No fences … just runway and grass between us and a jet. It turns out Agra, a one carousel baggage airport (aka tiny) has an airport that is also a part of an Air Force base. At our hotel we got checked in, settled, and then headed out for the afternoon with our guide, Navnit. Navnit took us to the Taj Mahal. The Taj Mahal was neato. We learned about its construction which was impressive in how quickly it was built. The outer walls around the Taj Mahal were also very impressive. To me the most amazing thing was the symmetry! Facing the front of the Taj Mahal you see mirrored buildings on the left and right. On the left is a practicing mosque, on the right is the exact same building (to keep the symmetry intact) that cannot serve as a mosque because it does not face the right direction. That’s some impressive dedication to symmetry. While wandering the site our guide pointed out people doing the pose where it looks people are holding the Taj Mahal (if you angle it just right). 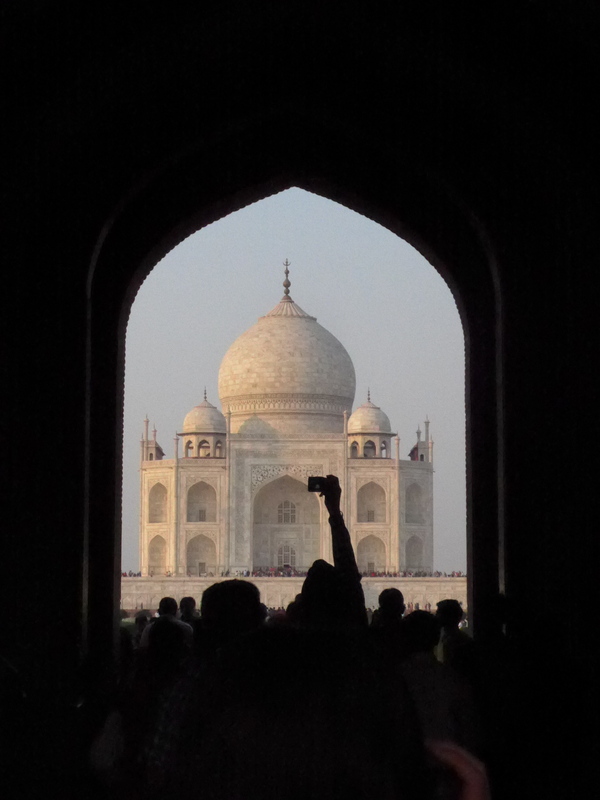 He told us it’s so corny and cheesy and then said, not ten minutes later, “if you want to do the pose where you pretend to hold the Taj Mahal I can take your picture,” spurred on by his comments we both said, “hmm no, that’s ok …” at which he responded, “oh come on!” The what? The other amazing thing at the Taj Mahal, which I talked about some in a postcard to Ellen … monkeys! Snacks are not allowed in to the Taj Mahal for, I would imagine, quite a few reasons. One of them must be the monkeys! While in the long security line I took picture after picture of the monkeys (there are four lines: Indian men, Indian women, tourist men, tourist women – the tourist line was massive, the Indian line quick as can be). We learned from the guide that the big problem for monkeys in India is diabetes! At the Taj Mahal the guards take any food you have on you and place it in a bin. The monkeys watch this bin with a hungry zeal and are quick to take any items out of it. And elsewhere, monkeys have found other ways to get their hands on food they really shouldn’t be eating. 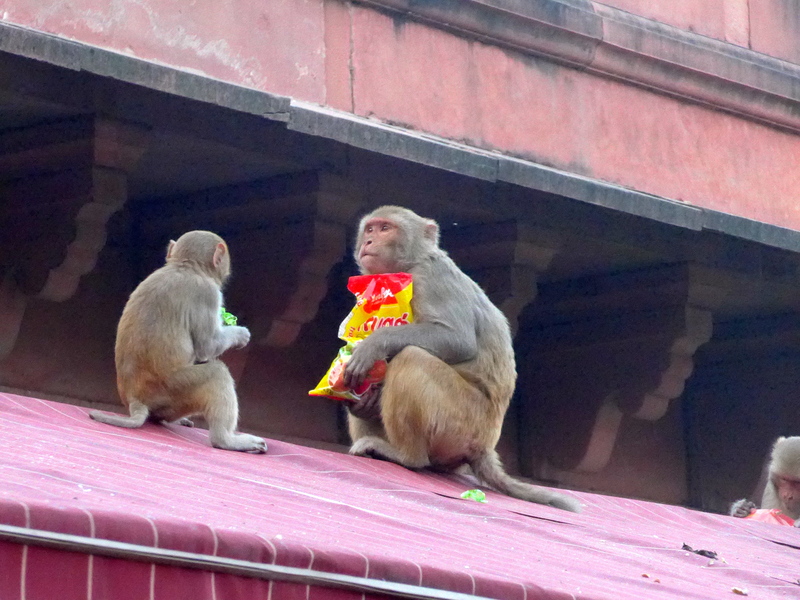 It’s sad, and apparently they can be quite a nuisance, but boy was it fun watching monkeys eat gummy bears. 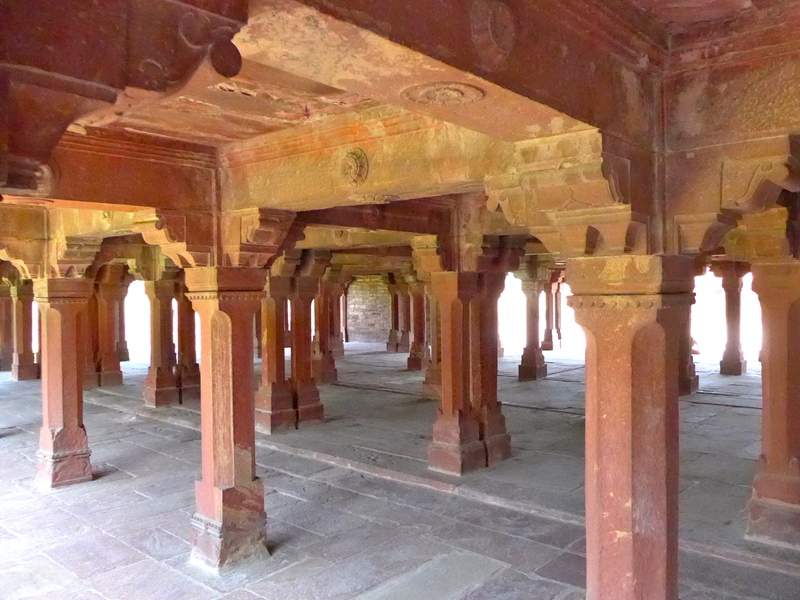 After the Taj Mahal we drove to Fatehpur Sikri. This was a fort occupied by Akbar, and the capital during during his time in command. The fort had low ceilings in many places for a strategic reason which we heard about at later forts and palaces – with low ceilings, people could not quickly draw their swords for a surprise attack. Clever, eh? The other amazing thing about Fatehpur Sikri, and so many places we saw, was the dedication to pretty smells, sounds, and sights. There was an platform with four thin walkways going to and from it, and around the platform there would be water. The water would have flowers placed on it to create a nice smell, while musicians stayed on the platform and played music. Akbar would observe all of this from about one story up, soaking in the good life. Not too shabby. One funny part about the low ceilings was that I would have to duck frequently. Three feet of clearance, then duck, then three feet of clearance, then duck, etc. A group of Indian teenagers spotted me doing this and began to laugh quite a bit. I looked back and gave them a smile which got them laughing harder. I guess my smile is the secret punchline. Another great part of this part of the trip was a conversation with our guide. On the drive to Fatehpur Sikri Lauren mentioned the paper route I had when I was a kid. Our guide was shocked! He tried to find a polite way to ask if my family was poor. Lauren and I explained that kids or teenagers working was not necessarily about supporting the family, in my case it was to help teach me responsibility and the value of money. Our guide seemed to try and try but could not wrap his mind around this. He told us that if his son was to go out and work, people would assume he had fallen on hard times. In India, he said, education is so important that children are raised with a focus on nothing but that – so the idea of a part-time job for the child’s sake is just unfathomable. Our guide then mentioned that he did like how independent Americans can be – he told us of someone from his neighborhood who could move to Mumbai and have a great job and make very good money, but instead this person was staying behind to help his family. Independent, to him, seemed to be defined as not being so bound to your family. It was an interesting conversation because I saw Indian families living in multi-generational homes and thinking how wonderful and educational that must be for the kids because they grow up with a greater appreciation for elder folks and have more people looking after them. The grass is always greener, huh? Low: Not asking the group laughing at me to take a picture with me! (They were all dressed in traditional clothes and looked beautiful! The colors in the places we got to see were amazing. 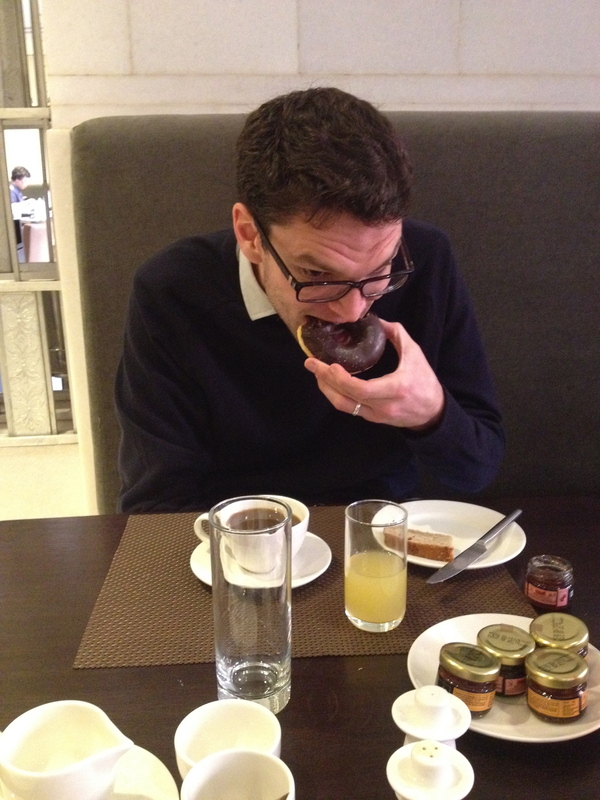 An American eating a doughnut?! NOW I’ve seen everything! The upside of insomnia? Dumbfunnery! Great blog post! So informative and so great you got to see the Taj Mahal, it looks beautiful!